1st May, off, 2nd may, off, 3rd may, off....where was i? 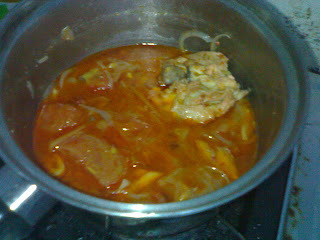 at home in kerteh, sleeping, makan....oh, yes...i was also down with hi-fever, bad cough and flue...alone in the house...it was frustrating..and lonely, yes....why didn't i go back to melaka? well, on this coming tuesday, i'll be having 2 day course in KL and i plan to go back to melaka after that and enjoy 4 days off at my parents house. my cousin is getting married on may 10.
i shud blame my cousin to all my misery during these 3 horrible days, for getting married on may 10 instead of 2nd or 3rd may. but it's her choice. she doesn't want to get married on the day that she knew many people will choose coz she's a lil afraid that not many people will come to her wedding. so much drama! but she could be right, i dunno...thinking back, if i were to go home the last 3 days, i don't think i can make it due to my condition. so, what did i do during those days? sleeping (long, long hours of sleep), watching tv, surfing (thanks to the free wi-fi, around my neighbourhood, i still dunno to whom it belongs, but a big thank you! ), playing monopoly (me against the pc, i always choose to go against first timer, yet, i still loose, geramnyerrr...was i that stupid?) and lastly, and the most interesting..cooking! susah nyer masak camnih...ekekekke. haruslah tk bleh masak lain2 dari itu kan.
mencuba tuh lebih bagus dari tak cuba langsung k!